Brazil has solidified its hold again on a notorious title as “the world’s most homicidal nation” with the release of new data saying the South American country saw a record number of murders last year. Homicides in Brazil rose by 3.7 per cent from 2016 to a shocking 63,880 last year. The study was released on Thursday, a few months before a presidential election in October where violence is fast turning out to be a crucial issue. The study is published by the Brazilian Public Security Yearbook 2018. The continuing rise in homicides is triggered by the presence of violent gangs who appeared to have capitalized on tighter law enforcement budgets and a political void caused by massive graft scandals. Data also showed that many of the record numbers of murders were concentrated in the country’s poorer northeastern states. 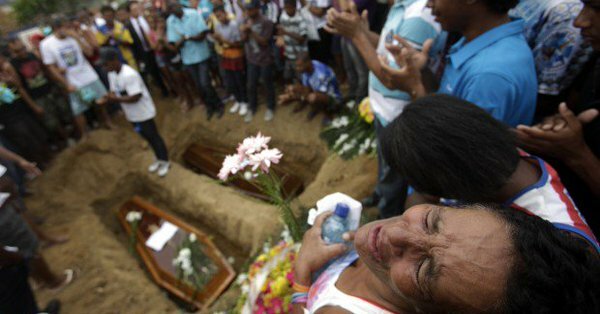 The state of Rio Grande do Norte had the highest murder rate in 2017, accounting for 68 murders per 100,000 people, followed by Acre, in the far west of the country bordering Peru, with 63.9 murders per 100,000 people. Sao Paulo, a far wealthier state, on the other hand, had the lowest murder rate of any state with 10.7 homicides per 100,000 people. Another cause for alarm for Brazil is the fact that rapes were also up 8% to 60,018, while 4,539 women were murdered, a rise of 6.1%. The report also said that more than 1,000 women were killed in hate crimes tied to their gender. While Brazil has strong domestic abuse laws, violence against women frequently happens. Just recently, the nation was shocked by the release of security footage of a man beating his wife moments before she died. The report stressed that organized crime is one of the reasons the rate keeps growing, and also added the crucial factor of violent police operations also play an important role. Said operations come in the wake of the police’s war on drugs and other criminal organizations. The report says there was an average of 14 deaths a day at the hands of police officers, which accounts for a 20 percent increase over last year. It is perhaps in such context of violence that far-right lawmaker Jair Bolsonaro is leading the presidential race. He is proposing to loosen gun laws and toughen up policing even further to tackle the rise in violence. India likely has the second highest number of homicides per year, with about 43,000 reported in 2016. However, its huge population results in a relatively low rate of 3.2 per 100,000. China’s rate is less than 1 per 100,000, while the United States’ rate is about 5 per 100,000. Drug-scarred Mexico, which also suffered a record number of murders in 2017, had a homicide rate of around 20 per 100,000 people. According to its local police, El Salvador’s rate stands at about 60 per 100,000. Venezuela’s rate, on the other hand, was calculated at 89 per 100,000 by international observers last year, and that is likely the worst rate in the world. The rejection of Christ Jesus is the reason for all perils of the world. Simple but true. The further from God we get the more we lose our God given natural affection for humanity, our neighbor, each other. It doesn't take a genius intellectual swimming in his own ego, denying the existence of God, to figure it out. LOOK AROUND! They feed us lies and we eat them up with a spoon and ask for more. The world is on fire. We need a Holy Ghost filled revival!! We need the truth exposed of what our governments have been doing and why. We need spiritual men with true intention to expose the criminal money mongers and destroyers of peace and humanity. May God help us worldwide! !